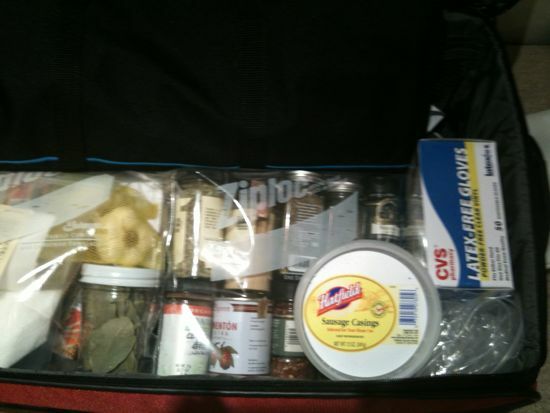 Never did I think this would be the suitcase I would pack to go to my first Blogher conference! I am excited, terrified, anxious and thrilled to be heading to Atlanta tomorrow morning. Kim and I, and Sean from Punk Domestics, will be doing a little sausage making demonstration and Charcutepalooza party on Saturday at 2:30, so if you’re there, please come to the session! We’ve been plotting and planning for months, and the folks at Blogher have helped us out with kitchen access, meat sourcing and more, so hats off to Jennifer Morris and the whole Blogher team. And big big big shout out to KitchenAid (and Jessica) for generously providing mixers and sausage stuffers and grinders. We couldn’t have done any of this without you. While I’m gone, why not make this easy veal demi-glace. Yes, easy. Really. I read this food52 post from Jennifer Steinhauer), and that’s what got me thinking. I know that naturally raised veal is available at this time of year. I have missed veal season in recent years and really regretted it. This year, I thought I would play with the technique Jennifer used, haul out that crock pot, and make some demi-glace. 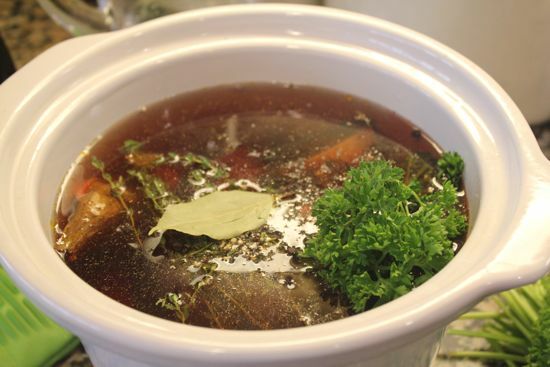 Read Michael Ruhlman‘s recent piece about veal stock for some solid reasons to make it. And then do it. The prep time is under an hour. So I put everything in the crockpot and forgot it for 15 hours. That’s some really good demi-glace. It’s deep and rich and satisfying. And packed up in 1/2-pint jars in the freezer. You will be so happy to have this rich goodness at hand. And, by the way, if you’re not going to make it to Atlanta, check in on the Twitter-based Blogher Pity Party (hashtag #BHF11PP) for all sorts of fun and games, as well as videos, podcasts, and amazing swag giveaways. Makes 3-1/2 – 4 pts. Rub the veal bones with the tomato paste and place them in a roasting pan. Add the onions and the head of garlic, cut in half. Drizzle the onions and garlic with a little olive oil. 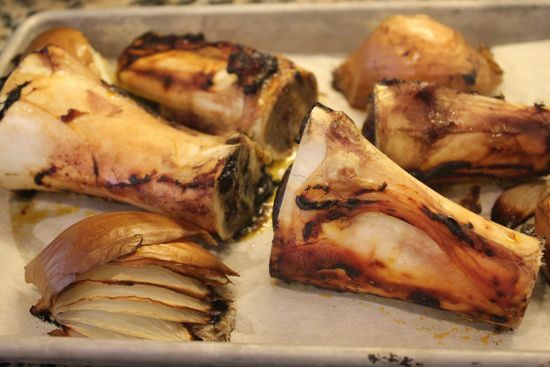 Roast the bones for 20 minutes, turn them, and roast an additional 20 minutes until they are well browned all the way around. Put the bones, onions and garlic in a slow cooker. Add the celery, carrots, sachet, water and wine to fill the slow cooker. Start on high until the liquid boils, then turn it down to low and cook for 12-18 hours. Turn the slow cooker off and remove the insert. Strain the stock through a fine chinois or through cheesecloth. Chill immediately using an ice bath. Skim the fat, pack into jars and freeze. Welcome to Atlanta! I hope all you blogging ladies enjoy your visit here. We’re so excited for you demo tomorrow! Love, love, LOVED your class! My favorite at the conference. All of your hard work paid off. You should speak to the people at the Weston A. Price Conference – Wise Traditions about doing a session at their conference. I go every year and love it. I feel like a session with you would fit right in! Thanks so much for all the planning… it paid off! Molly – Thanks so much! berries, meringue and cake. a new summer dessert.